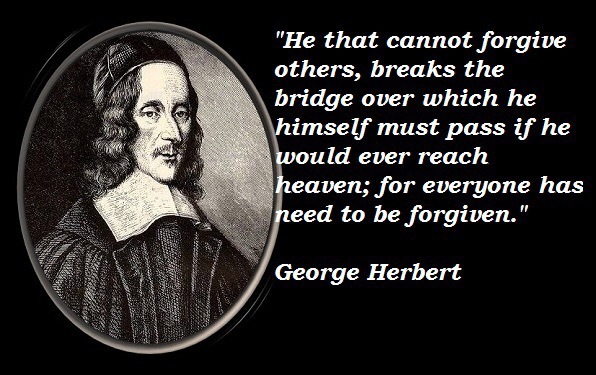 Yes indeed, forgiveness is for me and thereby for communiy. Visited Down Ampney church last week, following the RVW connection. Ralph V Williams’ father was vicar there and before that he had been a priest at George Herbert’s little church at Pemberton. Hadn’t known that! Not my cup of tea. The type of poetry I enjoyed prior to conversion was of another sort and the fact that his theology is Anglican makes him practically useless to me unless I want to follow the development of their theology and look to his stuff with an eye to see how the Anglican Church was thinking in that age, whether or not he was moving forward, or treading water so to speak, that is keeping up with those around him. I know the Anglicanism that is prevalent today is not the Anglicanism of his day, not by a long shot. Was he a trend setter? How did he feel about the Catholic’s priests being Martyred at that time? Was he ever asked to witness any of the ghastly proceedings when such men as Edmund Arrowsmith were hung drawn and quartered? I wonder if anyone here knows his stuff well enough to answer for him. But other than mere curiosity, I wouldn’t put any of his works on my must-be-read-soon list. Yuk. Maybe if you’d pay me……………………………….nuff said. God bless. Ginnyfree. He’s one of the great Anglo-Catholic poets – and far more Catholic than most modern Catholics. You tease! I highly doubt you can speak for “most modern Catholic” poets. Heave you ever read the poetry of St. John Paul II? It is good stuff but probably not what you’d expect. God bless. Ginnyfree. And life without the Four Quartets, what a dreary thought! There were none. He lived in the early seventeenth century. I don’t much like “Bind us together” as a hymn, but that wasn’t written by Herbert.